Even though it may not seem like the best way to spend your time, you're going to want to make sure that your range hood filters are maintained well. Top manufacturers such as Broan recommend that you clean the filters at least once a month. Longer life of the blower. Effective grease and smoke removal. Can All Filters Be Cleaned? Grease filters, as the name suggests, have a sole purpose of filtering out oil fumes and grease. 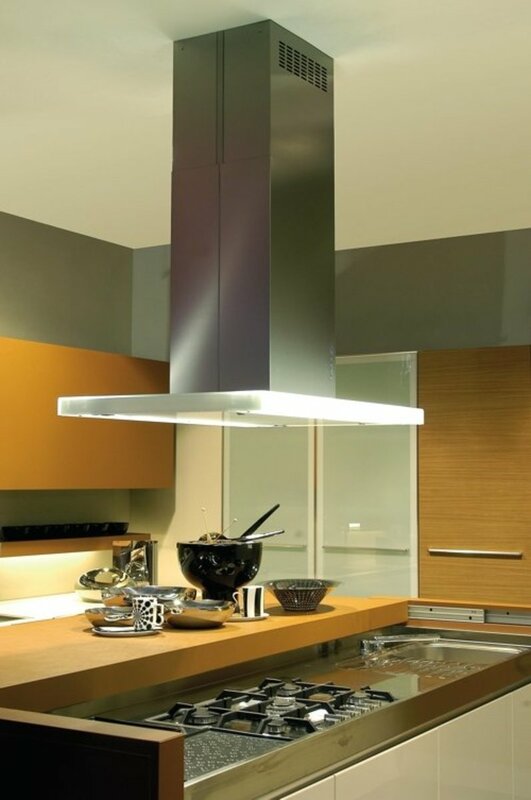 They are present in all range hoods with the exceptional of a few models in the past. Fabric grease filters work by absorbing the fumes and grease (much like a sponge) and cannot be cleaned but need to be replaced. Metallic grease filters can and must be cleaned often. They are usually aluminum or in some cases stainless steel. They would be either mesh filters or baffle filters and are usually visible at the base of your range hood. Charcoal filters are only going to be present in ductless models as their main purpose is the elimination of odor and smoke. This is only a necessary step if you're recirculating the air back into your kitchen. These filters must not and cannot be cleaned. Instead, they need to be replaced every three to four months, depending on how often and what kind of dishes you prepare. It may seem like a long process, but depending on how dirty your range hood filters are and the method you choose to follow, the total time could be anywhere up to an hour, whereas the actual cleaning time would be below 15 minutes. When Did You Last Clean Your Filters? I tried once, but gave up on it. This is going to vary based on your model. However, in all models, the filters are very easy to detach. 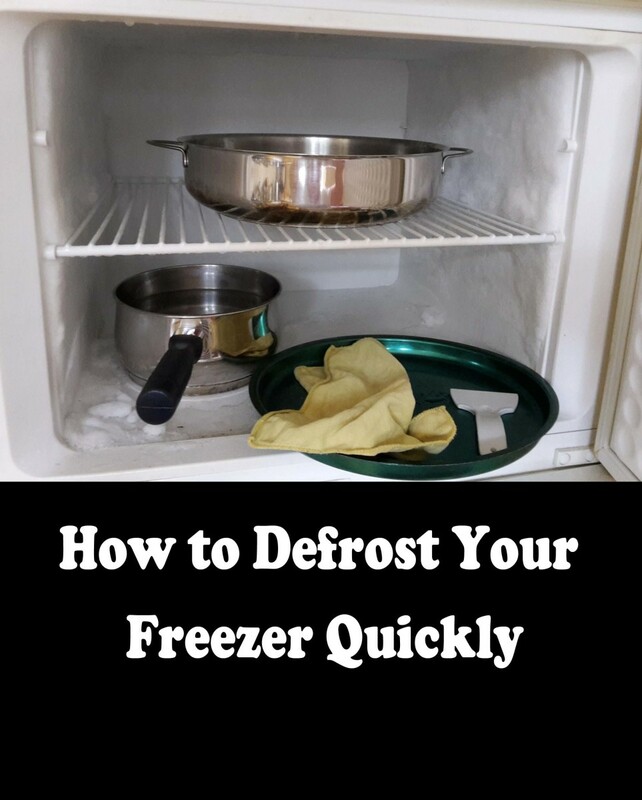 But before you start fidgeting and trying to figure out how to separate it from the rest of your hood, make sure that you switch off the appliance. Spend a moment to take a look at the overall setup of the range hood. Are your metallic filters clearly visible or are they mostly hidden? The first step is to make sure that you have a clear view of the filters. Remove any protective plastic or metallic casing that surrounds the base of your hood using a screwdriver. In 95% of the cases, there isn't going to be any protective casing. Screws hold them in place and they need to be unscrewed. A T-Lock or similar mechanism holds them in place. Rim supports where you just need to push up and rotate to set the filter free. Fortunately, the most difficult type of attachment that you're going to come across is one with a combination of a support and a fastener. The only reason I say it's difficult is because there are models where the rotating flap is placed at such an awkward position, you're going to find it difficult to get your fingers in place. Instead, you may have to use a spoon or a screwdriver to rotate it. We're now going to be covering step 3 to step 5 of the cleaning process. There will be no clear distinction between the steps as each of the five methods stands on its own and may skip certain steps. Note: I will be proceeding with the most effective cleaning method to the least effective. This is done to save reading time and you would only proceed to another method if you're out of stock on certain supplies and/or prefer another method due to simplicity. 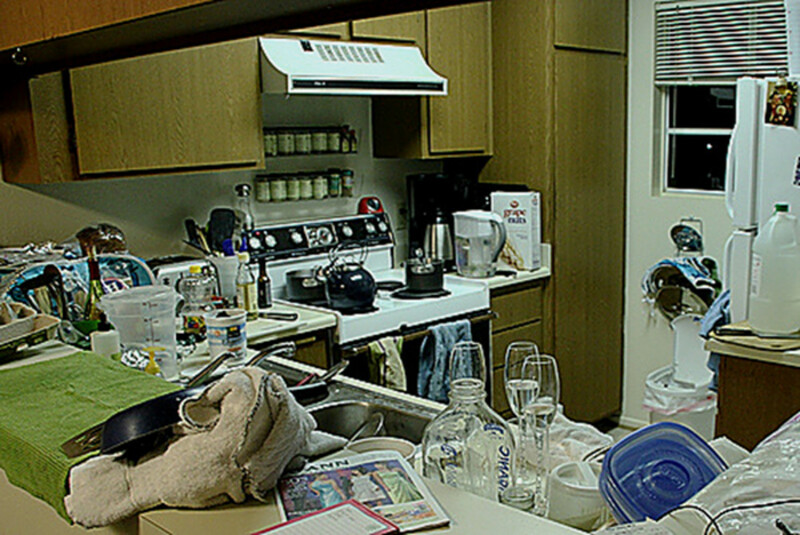 Rather than using dish soap or a grease remover, you're going to be using dishwasher detergent to get the job done. Wet the filter with a blast hose or under the tap (preferably with hot water as this gets rid of some grease). Place the wet filter in a pan or a sink (which is going to remain free for the next hour). Generously apply and spread dishwasher detergent all around the filter, including the metal rim if you want it to be completely clean. Leave no surface untouched. Let the filter sit for one hour. Place it in a sink under hot water and wash off the detergent along with the grease. Apply more detergent and scrub using a brush to remove any small traces of grease in the corners. For extremely greasy filters you may have to repeat the process and let it sit for another hour. There's a lot of scrubbing involved in this method when compared to the first. It may not be as effective, but the filters do get clean nonetheless. Find a cooking pot that is large enough to hold the grease filter. Fill it up with water so that the filter can be completely submerged (do not place the filter in the pot, yet). Heat the water, but not enough to boil. Spray a lot of degreaser into this water. Around 20 sprays if there's a lot of grease that needs to be removed. Place the filter and make sure that it is submerged. Do not let your bare hands touch this mixture as it is slightly acidic. Leave the filter in the solution for 30 minutes up to an hour. Remove the filter using tongs and place it in the sink and scrub hard on both sides. 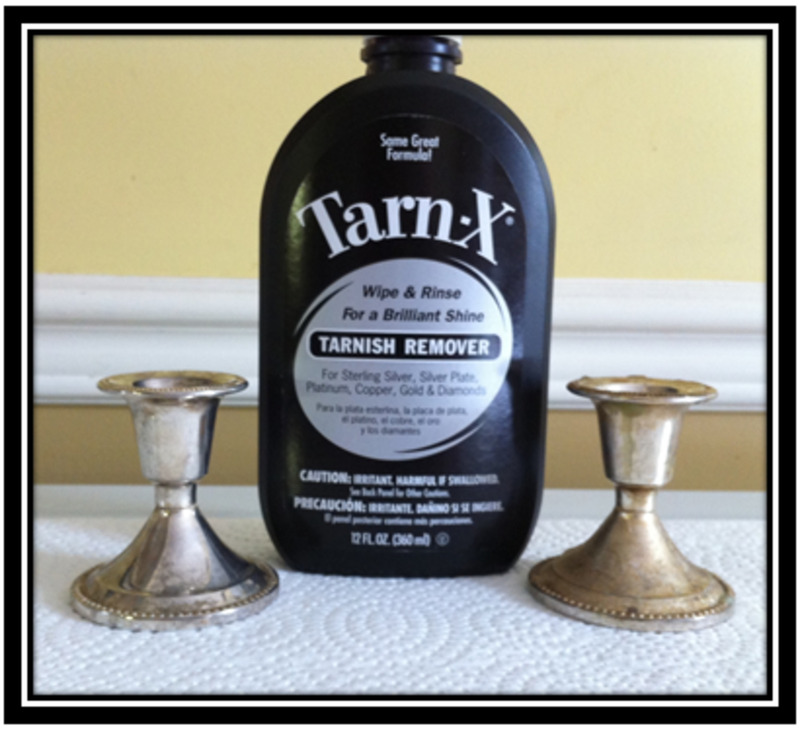 As an alternative to method 2, you could also use a combination of vinegar and baking soda to get the job done. Find a pot large enough for the filter and sufficiently fill it up with water. Once boiling add 3 tablespoons of vinegar and 2 teaspoons of baking soda to the solution, one after another. Add the baking soda in slowly and not all in one go. Place the filter and let it stay for 30 minutes to an hour. If you've been following your cleaning schedule and cleaning every other month, this simple method using just soapy water and ammonia (not always necessary) is all you're going to need. Block the kitchen sink and add water + dish soap. You may also want to add some ammonia to make the job easier. Mix the solution and then place the filter in. Use a brush and scrub on the filter. Most modern day range hoods come with dishwasher friendly aluminum or stainless steel grease filters. 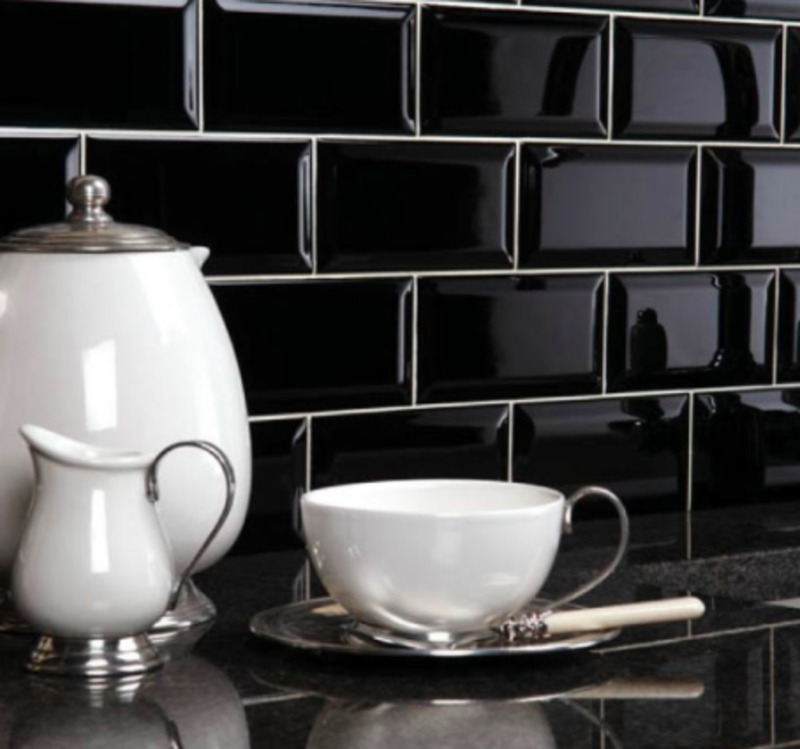 You're going to need to look at the product specifications to find out if the filters are dishwasher friendly, alternatively, you could look up reviews of the product or contact customer support. If your filters are dishwasher friendly, you should, by all means, make sure that you clean it every other month. Because, if you do this consistently, you're not going to have to worry about scrubbing and using special solutions to clean them. However, if you've failed to regularly clean them, your filters may have accumulated a lot of grease and dirt. In this case, just placing them in the dishwasher is not going to do much. You will instead have to follow one of the first three methods explained above. Since the filters are metallic, I would not recommend using a blow dryer as this could in unfortunate cases lead to electric shocks. Therefore, the best thing that you could do is allow them to dry in time. Before you set them back in place, make sure that they are completely dry as you don't want the wiring of the range hood getting wet by any chance. A dirty range hood doesn't just damage the range hood and increase your electricity bill, it's also a health and fire hazard. A dirty range hood is greasy, slimy and warm. This is an environment where some pathogens (bacteria and the like) thrive. Also, the small food particles that are carried along with the fumes and settle on the filters help feed the growing bacteria. The oil and grease deposits on your range hood, just above your cooktop are a fire hazard waiting to happen. It's not common that fires are caused this way, but there have been a few cases where uncontrolled flames on the stove have risen and ignited residues on the range hood filter. There are bound to be oil and grease deposits on certain parts of the range hood which are immediately above the cooktop and also around the grease filters. These areas can easily be cleaned using a mild degreaser. All you need to do is use a napkin, spray some degreaser and wipe away. Make sure that you read the instructions before you spray, as some of them are concentrated and you need to mix with water before use. 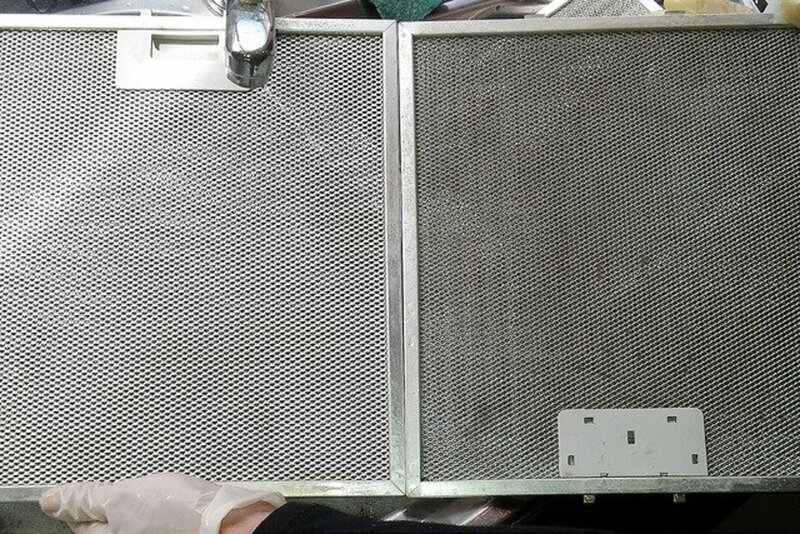 Can I clean range hood filters in the dishwasher? If the manufacturer says you can, then you could. If you don't have those details use your own judgment. Are there small parts that could be damaged? If yes, do not put it in the dishwasher. What Is a Range Hood and Why Do I Need One? Hey Marian, cleaning the fan. Hmm, it really depends on your range hood model. 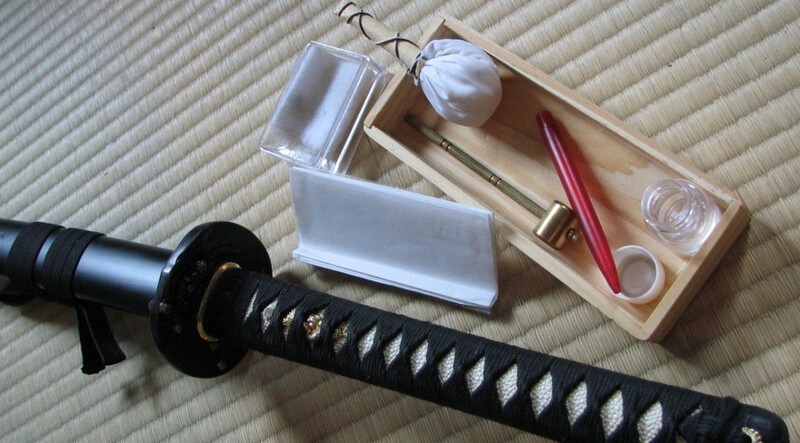 I would most likely use a damp cloth, soaked in some cleaning solution to wipe the blades. I would also advise against getting any electrical components wet. After cleaning the fan, as a precaution, I would suggest that you do not turn on the range hood for at least a few hours, allowing any moisture on the electrical connections to dry up. Do come back and let me know how it goes and what you decide to do. I would love to add to this article, and I'm sure it would help many readers in the future. Hi Brandon: thanks for your awesome write up. Cleaning the filters are no problem. The question I have is: do you recommend cleaning the actual fan? I have had difficulty finding info on this. Hi Carl, thanks for sharing. Glad that you managed to clean those filters. I cleaned my range hood filters last night. They were very greasy. First, I tried a strong ammonia solution -- no good. Then I tried a strong dish detergent solution -- no good. Finally, I tried a strong dishwasher detergent and very hot water solution -- worked! Hi! Brandon, we do learn from each other here on Hubpages. That is what I like about the website too. Too many things to learn and share. Thanks. Hi Linda, white malt vinegar on burnt stuff, I should try that out. I try and use force or hot water to help. Thanks for the helpful tips. Hi! Brandon, what a well written and informative hub. Thank you. What I find best for cleaning cooker hoods is the vinegar and baking soda combination and fairy liquid just to finish it off. Or sometimes I use the white spirit they use for thinning paint. I spray the cooker filter and leave it for an hour or so then I clean it with fairy liquid. I tried degreaser products but they don't seem to work, also very expensive. Vinegar and baking soda is the best cleaning agent for cooker filters I think, and not so expensive. I use white malt vinegar for burnt saucepans and baking trays. Just soak it with vinegar overnight and clean it the next day. The burnt stuff comes off easily. So I took a lot of chemestry in school, and paid for that schooling with reseaurant work, including cleaning range hoods. Don't dilute your degreaser if it comes in a spray bottle, it is already dilute. spritsing spray degreaser into a large amount of water is counterproductive. On the other hand, concentrated degreaser needs dilution with hot water to work. Industrial purple from Zep is similar to what the pros use. If you use vinegar and baking soda, think about what you are doing. Vinegar is an acid, baking soda is a base, they cancel each other out and produce co2 and salt. co2 and salt are not useful. Basking soda is good to use dry or in paste form, for a variety of jobs. Vinegar is great for other jobs, expecially descaling. Mixing them together is deactivating both. So to follow the instructions here, what you are doing is cleaning the filters in a weak acis bath, that you make weaker as you add the baking soda. And in the process you are doing nothing for grease. Just because grandma used it doesn't make it work. Gradma cleaned things by scrubbing and scrubbing, the baking soda and vinegar did not actually help, only the hot water did, b ut grandma and dish soap did most of the actual work. The foaming action has the illusion of scrubbing bubbles... bubbles can help agitate, but they don't scrub and they don't really help with /this/ task. A stong alkali in boiling water will work for a quality stainless alloy, turning the grease into soap, but that is dangerous for the skin and can produce fumes... But when grandma was serious about degreasing something hard to scrum, lye was her go-to degreaser... Turn that grease into soap then it just dissolves in water. The alkali will destroy aluminum, so industrial blue degreaser is the best for aluminum. Grandma used lye for a lot of serious cleaning, but it is not safe, so stick to the degreaser and dish soap. If your sink is large enough to soak the filters, a good automatic dishwasher detergent is also good, this is what I use at home when I don't have industrial purple.Automatic dishwashing powder is great for soaking, and will help loosen and lift the soiled grease out of hard to scrub areas. baking soda and vinegar together are for leavening old fashioned from-scratch cakes... THAT is where vinegar and baking soda chemistry actually does more than make a salt. Hi Colleen, maybe try finding something that fits in to those knob holes perfectly so that you have some leverage to get them out? You're going to have to improvise with something at home. Good luck. I have a Faber hood with baffle filters. They are not installed properly so the knobs to remove baffles are not there. Is there a tool I can use to pull the baffle back enough to remove it! There are holes for the knobs but no knobs! Please help if u can! Thank you for this comment iSky, there was someone who was complaining that this is against high school chemistry, mixing an acid and a base. It works, the mixture of vinegar and baking soda. My filter was horrible. I soaked it overnight first using dish soap. Then for an hour with dishwasher soap. It was very clean but had a couple spots. Then used the vinegar and baking soda method. Came out sparkling clean. In most cases I find the dishwasher works great for cleaning these extractor filters, just make sure they are fully dry before re-fitting otherwise corrosion can appear.